Water doses are the cleanest way to take most remedies to cause the least likelihood of homeopathic aggravation of symptoms. As a classical homeopathic, my goal is to cure symptoms AND cause the least aggravations. It's important that I ensure you understand how to take the remedy properly so I've written quite a bit of material on this and the linked page below. Use a new 2ounce dropper bottle filled with pure water OR a bottle of water (you will throw out later, not reusable) with 2 ounces of clean, pure water in it (not tap). I prefer Penta water. Distilled works well also. Essentia and Smart Water have too many minerals in them, avoid mineralized waters. 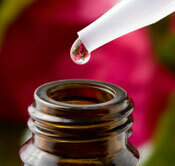 Pour 2 pellets into the cap of the homeopathic bottle and drop into the bottle with water. Wait 3 minutes for the homeopathic to begin to open in the water, it doesn't need to fully dissolve. Shake hard against hand 3-5x. Take 2 drops under or on top of tongue. Please see the linked page below for more on what to avoid with your remedy, what to anticipate and how to store it. Let me know if you have questions.